Arisun tyres are high quality, built with high tech features, and designed to perform. Whether off road, in the city, or on the track, you will enjoy the ride on Arisun tyres. Arisun tyres are designed in the USA and manufactured by Zhongce Rubber Group Co, China’s largest tyre manufacturer. Zhongce Rubber Group utilises state of the art manufacturing equipment and recent investment in a new high tech Research & Development centre ensures the latest innovations and technology are integrated into each product. ZC Rubber Employs a work force of ever 30,000 people and takes great pride in producing tyres that are rated among the best in the world for ATV, Truck, Motorcycle, Passenger & Bicycle equipment. 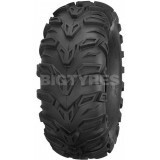 The Arisun AT-12 tyre is designed for all terrain use, and is especially good at shedding mud for a consistent grip. The aggressive tread blocks of the Arisun AT-12 tyre are strengthened by a reinforcing rib running between them help to provide great traction. The 6 ply rating construction of the Arisun AT-12 tyre helps to provide better puncture resistance performance and improve tyre life.